Delta Skymiles are often ridiculed for being low value and moving the industry dangerously to a revenue based model, but they sometimes are quite useful, given that American, United, and Aeroplan have all devalued in the past few years. I received a neat email where Delta is discounting the miles required for economy class trips between the US and Canada on the west coast. 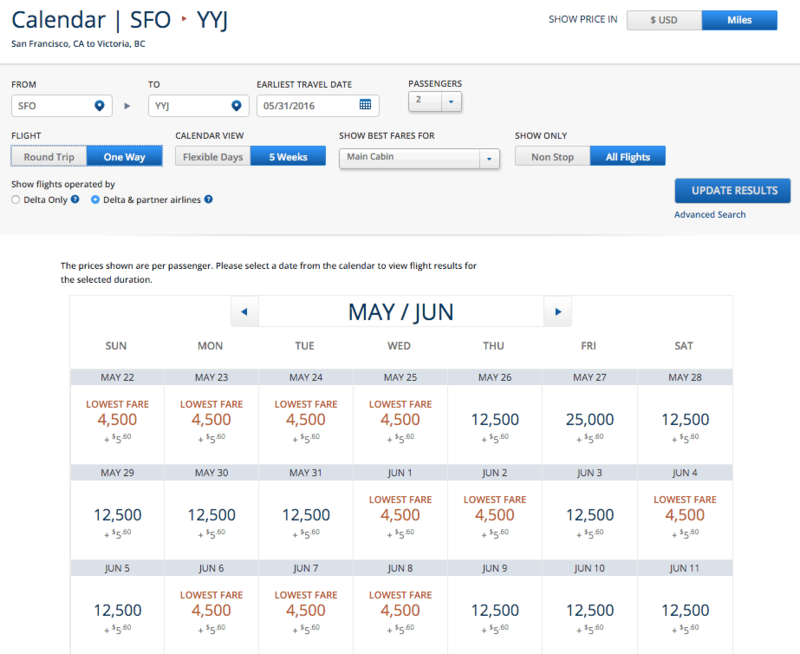 There are some stunning deals available, such as 4,500 miles from Victoria to San Francisco. Normally, this would cost 12,500 Aeroplan each way. I’m guessing this has something to do with the weakness of the Canadian economy, and the strength of the US Dollar which makes ex-Canada traffic to the US much lighter than previous years. While the cash fares are relatively cheap on these routes – it’s worth comparing to a miles ticket as there are some city pairs that are more expensive than others. The discounted price is not available every day. However, since Skymiles simply charges airport taxes on these awards, taxes start at only $5.60 departing from the US. Sacramento, CA to Edmonton, AB: July 12, 2016, July 15 – July 19, 2016 and July 22 – July 26, 2016. These fares also work on the east cost – for example Orlando to Montreal is only 9,500 miles. Until Delta comes back with a co-branded credit card in the Canadian Marketplace, this sale works best for those who already have Skymiles. American Express Membership Rewards transfer at a 1:0.75 ratio – therefore it’s only worth it for the redemptions that are 4,500 miles. Starwood points also transfer at a 1:1 ratio, but I would recommend saving your valuable SPG points for other redemptions. Keep in mind that Delta elites also get upgrades on award tickets, so that stacks even more value with this sale. 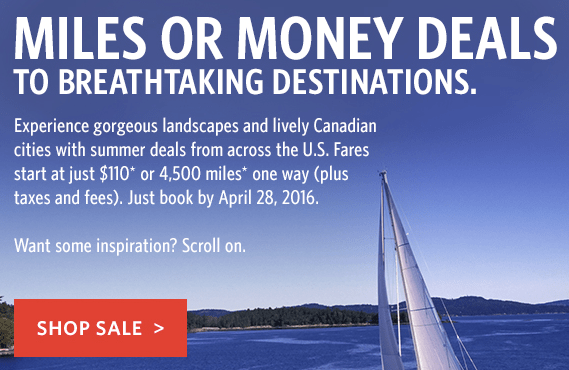 For full details, see the Delta Award Sale to Canada here.